Nearly 600 Auburn University students with a flair for research and creativity will showcase their talents when they gather for the annual Auburn Research Student Symposium. 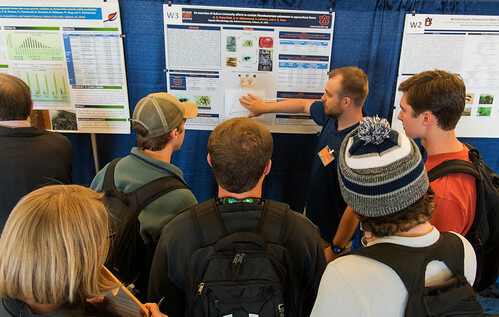 With projects ranging from chemical engineering to plant pathology to architecture and design, the symposium on April 9 will provide Auburn and Auburn Montgomery students an opportunity to share their discoveries university-wide. The daylong event will take place in the Student Center. Undergraduate and graduate students from almost every department have registered to participate through posters, oral presentations and creative scholarship displays. Approximately 400 of the young researchers will present posters and displays more than 180 will give 10-minute talks, all under the watchful eyes of judges who will award top honors in a variety of university-wide and college-specific categories. An awards ceremony and reception will be held April 18 at 5 p.m. in the Student Center ballroom. The keynote speaker will be Michael Zabala, assistant professor of mechanical engineering, who earned his bachelor’s degree at Auburn in 2007. Following the April 9 symposium, Nobel Laureate in Chemistry George P. Smith will visit Auburn University and the College of Veterinary Medicine April 10-11. Professor Smith will present a public lecture at 2 p.m. April 10 in The Hotel at Auburn University and Dixon Conference Center auditorium, which will be followed by a reception. On April 11, he will be available to meet with faculty and students at the College of Veterinary Medicine. A fall event, the Auburn Research Faculty Symposium, will be held in September to recognize faculty excellence in research and creative scholarship. More information about the student symposium is available at www.aub.ie/researchstudentsymposium or by contacting Taylor at taylost@auburn.edu. 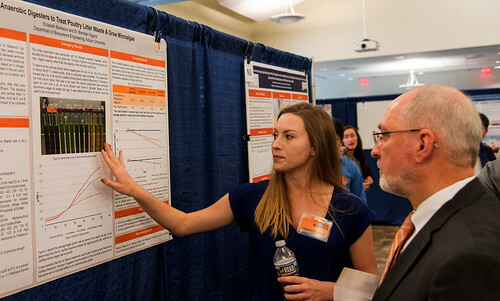 Auburn students with a flair for research and creativity will showcase their talents when they gather April 9 in the Student Center for the annual Auburn Research Student Symposium. Pictured, student Elizabeth Bankston discusses her research poster with Steve Taylor, chair of the Research Symposia Committee, at last year’s symposium. Auburn students with a flair for research and creativity will showcase their talents when they gather April 9 in the Student Center for the annual Auburn Research Student Symposium. Pictured are students at last year’s symposium.